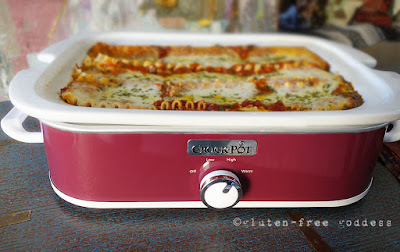 Slow Cooker Lasagna As it Should Be. Delicious! And perfect for Christmas week. It’s been a long time since I flirted with a new kitchen appliance. Truthfully? I barely have room for the few gems I still have, after all these moves, efficiently poised and ever ready to cook here in my latest cozy (read: petite) apartment kitchen. You know the one I’m talking about. The kitchen without an oven. Yep. That’s right. In Rental World they don’t always give you a full size, actual oven. They might give you a four burner cooktop. And a rickety microwave. So what’s a gluten-free lasagna craving girl gonna do? Make a mug of chai. Cruise Amazon. Because this- Crock-Pot Casserole Crock Manual Slow Cooker. Brilliant. I assembled this classic family style lasagna at noon today- using UNCOOKED gluten-free lasagna noodles, browned ground turkey, three Italian cheeses, and our favorite pasta sauce. And by 3:15 we were gathered around the Crock Pot, inhaling the aroma of bubbling, garlicky tomato sauce and melting mozzarella cheese, grabbing our forks in gratitude. 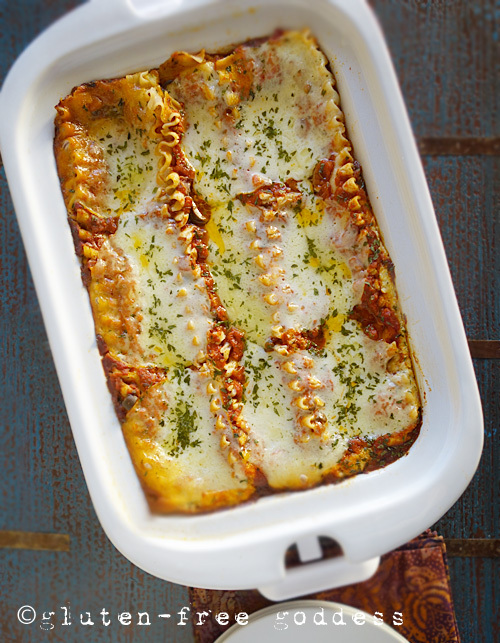 An easier homemade lasagna I have never made. It was perfect. The rice lasagna noodles were tender. The filling hot and creamy, the melted cheeses velvety soft.